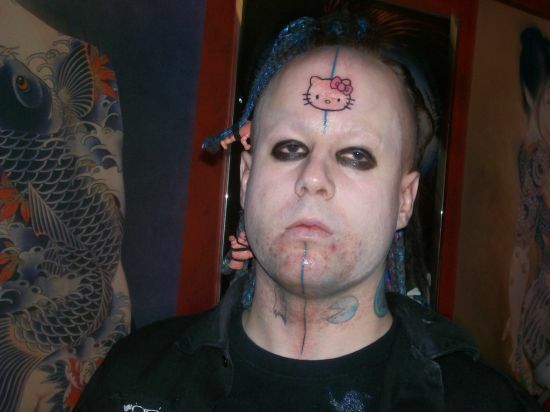 Home Off Beat	Hello Kitty Tattoo on forehead; yeah WTF! Cute is the word thrown at me with a Hello Kitty Tattoo. Well I throw back moron! Anyhoo, I canât think of any one place where you should ink this evil feline, but then some people love her like anything. But no amount of love could explain a Hello Kitty Tattoo on someoneâs forehead. A drinking binge and a numb visit to a tattoo parlor thereafter is the only explanation for something like this. I canât think of anyone inking the damn kitty smack in the middle of his forehead but then who knows what the feline is capable of. Thatâs one perfectly good forehead wasted right there. On second thoughts though looking at this guyâs stoned look, horrible teeth and ugly eye makeup, maybe a freakin tattoo is the least of problems on his head.